Historic Old Quebec City Condo, Comfortable and Quiet! This rustic and comfortable condo is centrally located 500 meters from the Boardwalk near the historical Chateau Frontenac Hotel. The walls to the fortified Old City are just outside the door of our condo that has thick walls of its own . From this location all the sites of the Old City are at your doorstep. Whether you come to shop, eat, sight see, or just breathe in the ambiance of our beautiful City you will be centrally located to do so from this condo. If you are into skiing, both Stoneham and Mont Ste-Anne are 30 minutes down the highway. 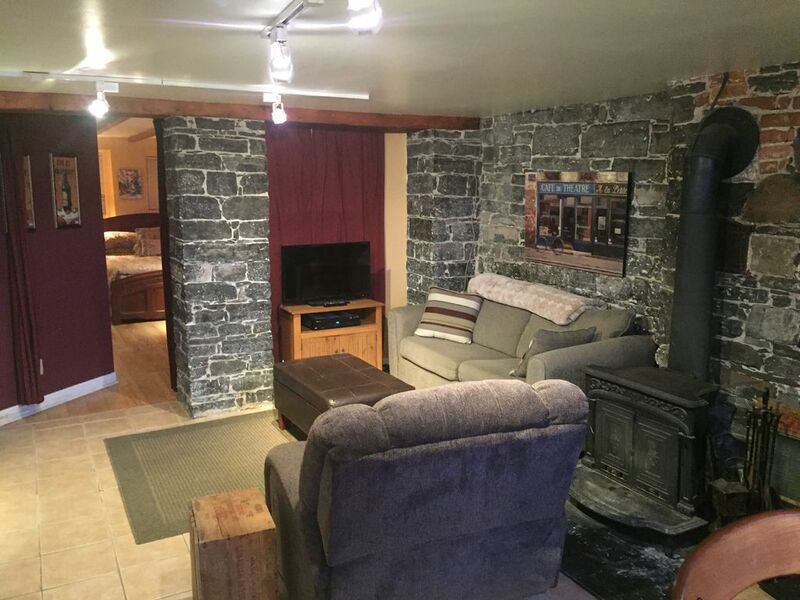 The condo is nicely decorated and naturally decorated by stone walls and wooden beams in the ceiling. Come and enjoy a little piece of history staying in the only fortified city in North America. Send me an email to oldcityrentals2012@gmail.com if you would like to know more details. Our guestbook boasts positive comments from visitors from China, Korea, Holland, Malta, Belgium, Mexico, Russia, and of course throughout Canada and the USA. Come and see the beauty they found staying in the heart of Historic Old Quebec. If we are already booked and your dates are flexible then send me an email at oldcityrentals2012@gmail.com. Maybe we can work something out. We have lived in Quebec City for our 26 years of marriage and I am a Mother of six great kids. We have been sharing our little piece of Old Quebec while we are not using it since 2002. That is why our listing number has only 5 digits. We love it and I think you will too! We thank all of our past guests and also our future guests for helping us bring more people to Quebec City to enjoy "living like a local". If we do not still have your dates available then I hope we can help you in the future. The Old City allows you to step back to the year 1608 when Samuel Champlain came and founded what has become a UNESCO World Heritage site. When we first came to Quebec on our honeymoon we decided that this would be the place where we would set down roots and begin our family. Six children later the roots are too deep to pull up so it looks like the Old City is stuck with us! The benefit of a stay at the Little Door is the '5-Factor' Leaving the front door and walking for about 5 minutes puts you in touch with some of the best restaurants in North America. You desire crepes for breakfast? Why not stop at Casse Crepe Breton and watch as they make them before you eyes stuffing them with fresh fruit... chocolate... and whip cream for those have been good boys during their travels! You want to discover antique shopping... no problem... 5 minutes on foot. You desire a lovely stroll along the St. Lawrence River... no problem... 5 minutes on foot. You would like to take in a pub and have a glass of wine or a pint of your choice... you got it ... 5 minutes! So, the '5-factor' is alive an well at the Little Door condo. Full bathroom with deep bathtub for relaxing. There is a washing machine available in the common area of our building that you can use during your stay free of charge. There is a dryer available in the common area of our building that you can use during your stay free of charge. We have a parking spot that you can use during your stay for only $10 per day. It is a few small blocks from the condo. Other parking spots at city lots are about $16 per day. The television is in the living room area. Fully equipped kitchen. The Farmers' Market is just down the hill from our condo and it is open daily! Cable tv is provided with a mix of Canadian/American English channels and local French channels. Wifi included. The Sweeney’s were wonderful hosts! The apartment was exactly as described, very clean, charming, and in a fantastic location. Everything in the old city is a short walk away and there are pretty views right from the door. We hope to go back some time!! The pictures accurately depict the atmosphere and decor of this grotto apartment. It's actually bigger than it appears. It was very warm, which is especially nice with the cold winter temps just outside the door. Ed met us promptly and showed us to the parking spot and the apartment. We didn't need anything else during our stay, so no need for additional communication with the owners. The unit was well stocked with kitchen supplies. The pull out sofa was serviceable for one adult. The big bed in the master was very comfortable. There was plenty of extra bedding and pillows. If the photos appeal to you and the idea of a subterranean apartment sounds cool, don't hesitate to stay in this fantastic location with attentive owners. Thank you! P.S. Arriving to the old City is easy, but the sudden change from highway to narrow streets can be shocking. I imagine most people arrive in the afternoon, so there are lots of cars and pedestrians on the street, but we managed to do it without incident and Ed escorted us promptly. Cozy & close to everything important! Perfect location to see every part of Quebec City and its outskirts. So easy to get around! If you want to be able to walk everywhere and be part of the historic part of this beautiful city, this location is exactly what you are looking for. Its stone walls remind you are living in a part of the original buildings of Quebec. It is very comfortable. The bed is comfortable, the bathroom has all the modern amenities and the kitchen and living room area are suitable for cooking and eating, if you choose to do so. On the other hand, you may prefer to head out to sample some the excellent restaurants, all within easy walking distance. Carole welcomed us to the rental, made sure we had everything we needed and showed us where to park our car. We plan to stay here again when we have the opportunity to visit Quebec City in the future. Thanks for a great experience! Excellent location-quiet, out of traffic but easy access to old town and port. Comfortable quarters. Roomy for 2, comfortable couch and recliner. Tiny door for access, but it worked. Kitchen and laundry were adequate, but as usual for us we didn't need them. Modern comforts within authentic Old World character. If you want to meet with the nicest hosts and stay in an authentic Quebec basement apartment then this is the place for you. Located in Haute Ville along the Rampart it's an easy walk (even for seniors) to most anywhere within the Old City walls. Totally charming and comfortable you'll be "living like a local" within a day. Sit by the pot belly fireplace and enjoy wine and charcuterie from the deli around the corner or take a walk and get crepes at Au Petit Coin Breton. My husband and I loved every day of our stay here in Quebec. Tom & Lou O. Antique shops, street busking entertainment, horse drawn carriage rides, guided walking tours, bus tours, and much much more. Send me an email to oldcityrentals2012@gmail.com and I can explain other attractions close by our condo. Rates are subject to change and could be discounted or negotiated. We can consider rentals of less than one month if we do not already have a renter for any part of that month. Please email me, oldcityrentals2012@gmail.com if you have any questions or concerns.